This Turkmenistan Easter tour kicks off in Ashgabat — Turkmenistan’s capital city, described by some as the “Dictator’s Playground”, with its white marble facades, gold monuments, and buildings with titles such as the “Wheel of Enlightenment” and the “Arch of Neutrality”. 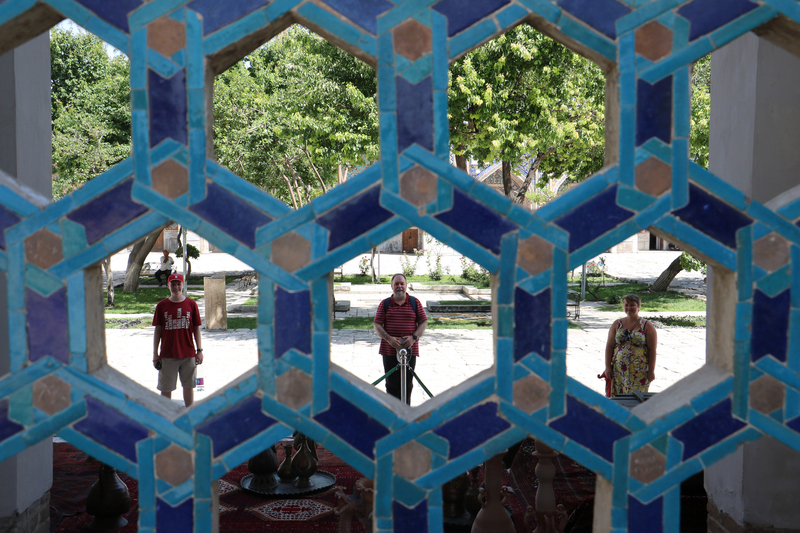 From there, we head to UNESCO world heritage Nisa and onto our homestay in the village of Nokhur. 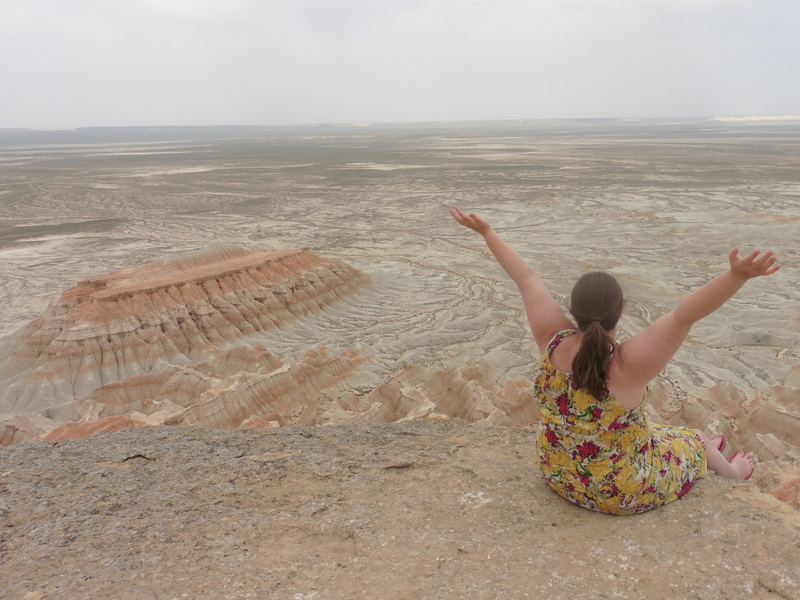 Next, we’ll take the long drive into the Karakum desert towards futuristic Avaza and Turkmenbashi via Yangykala Canyon. 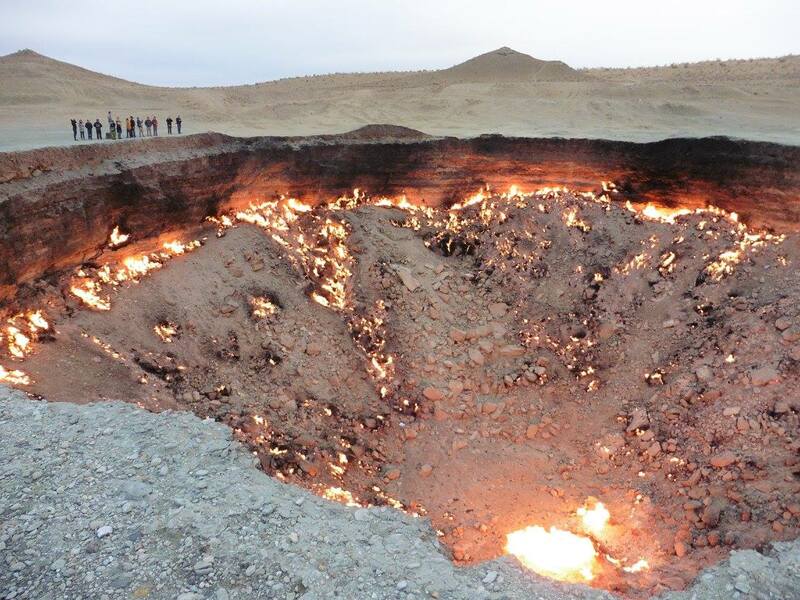 We round off the first part of this tour with a visit the must-see Darvaza gas crater – eternally burning fire crater known as the “Gates of Hell”, where we set up camp for the night. 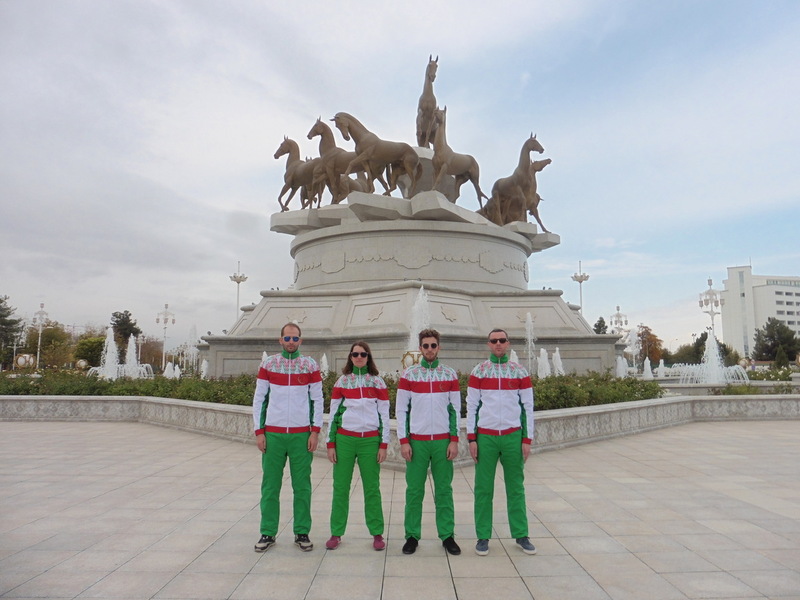 Driving tour of Ashgabat’s main sites, including Independence Park and Independence Monument, the Monument to the Constitution, the Arch of Neutrality, Lenin Park, Ertogrul Ghazi Mosque, and the Alem Centre, which is the complex that is home to the Wheel of Enlightenment, the largest indoor ferris wheel. And YES, for just $1, you can even take a ride! Stop for lunch at Berkarar Shopping Centre, where you can go ice-skating, play in the games centre, ride a miniature double-decker bus, and even have a cappuccino in a hipster face (don’t get your hopes up too much about the cappuccino, it is still from a machine which has a “cappuccino” button) . Visit the university bookshop where you can find books written by and about the president of Ashgabat and Turkmenistan in English. They also have postcards and posters, and if you’re lucky, they might even have a copy of the Ruhnama, the book written by Turkmenbashy. Dinner and drinks at a pub in the city centre, which serves shashlicks, kebabs, and local draught beer. Approximately $8 pp + drinks. Drive to Nisa, a UNESCO site which was once the capital of the Parthian Empire. Visit Anau on the eastern outskirts of Ashgabat, and see the remains of Anau Fortress and Sheikh Jemaladdin Mosque, which was destroyed in the 1948 earthquake. Lunch at a local restaurant in Chuli Gorge, with spectacular views of the surrounding mountains. Approximately $8 pp. Continue on to Kipchak to see the resplendent Turkmenbashy Mosque, where Turkmenbashy is buried beside his mother, father, and two brothers in their white marble mausoleum. Drive to the outskirts of Ashgabat to Kow Ata. This natural underground thermal spring is said to have many medical attributes, but is also used by locals as a swimming hole and makes for a very fun and relaxing swim. Admission included. After a revitalising swim in the lake, we’ll enjoy lunch at one of the shashlik restaurants just outside the entrance to the cave. Approximately $3 – 6 pp. Visit Nokhur Cemetery, where each grave is adorned with the horns of a mountain goat. We’ll stop for lunch along the way at a local chaykhana. Approximately $2 – 5 pp. Visit the bazaar to buy snacks and lunch for the following day’s trip to Yangykala Canyon. Yangykala Canyon. Many Turkmens don’t even know that this place exists, but once you’ve been there, you’ll start calling the Grand Canyon the “Pretty Good Canyon”. In 4×4’s, we’ll drive over the canyon walls, through the canyon itself, and up the other side, to an excellent vantage point , from where you will be able to see all the shapes and colours of this spectacular natural phenomenon. Dinner at the hotel. Approximately $8 – 10 pp. 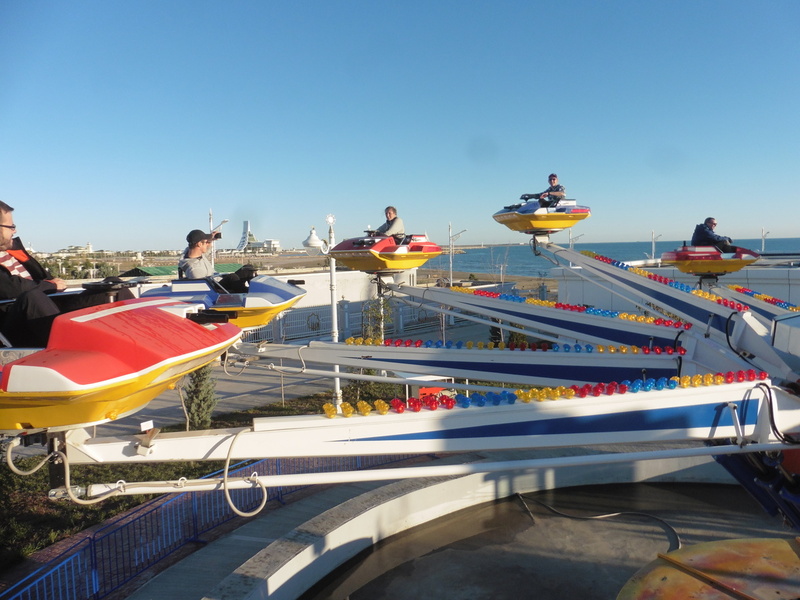 Take a small drive around Turkmenbashy before paying a visit to Avaza, a ten-minute drive from Turkmenbashy, and have a driving tour of the beach resort. Although the facilities are extravagant and the buildings futuristic, the town is somehow best described as a ghost town. Lunch in one of the glamorous hotels of Avaza. Approximately $10 – 12 pp. After lunch, enjoy some free time to explore the amusement parks, beaches, and hotels of Avaza. Dinner and drinks at the British Pub. Approximately $10 – 15 pp + drinks. In the morning, drive to the outskirts of Ashgabat to Serdar Yoly, the “health path”. Stretching 28km along the Kopetdag mountain range, this fitness project was instigated by Turkmenbashy, but being a keen health fanatic himself, Gurbanguly has continued to encourage people to make the trek. You’ll have time to either walk some of the path if you like, or you can just soak in the atmosphere in the park at the bottom. Take a ride on the cable car which reaches almost all the way to the Iranian border. At the top you’ll get spectacular views over the city, the health path and the tv tower. Lunch at the Russian bazaar, where you can also buy some snacks, drinks, and dinner for camping. Return to our tents, which have been set up for us near the Gates of Hell and camp near the fiery crater. Dinner at the Yyldiz Hotel. Based on the Burj Al Arab and by far the most luxurious hotel in Ashgabat, the restaurant on the 18th floor is the perfect place to look over the city as the sun sets. 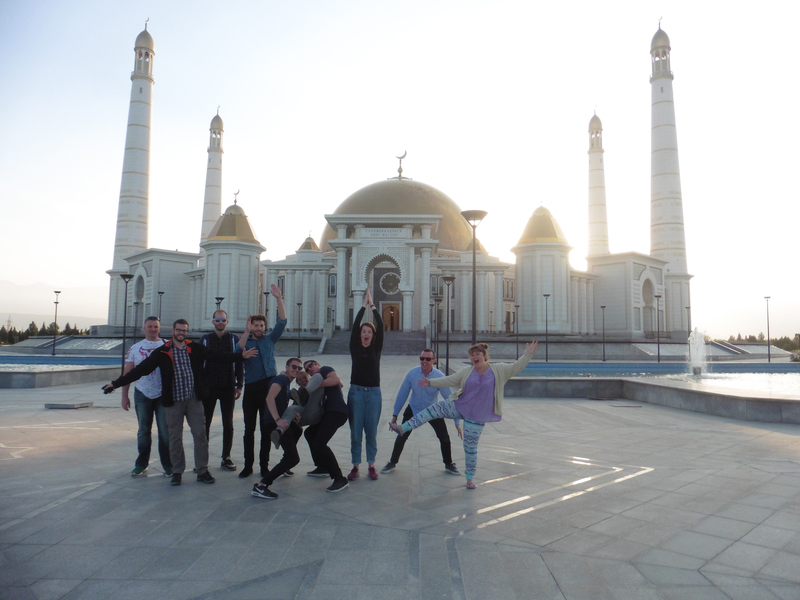 After dinner we’ll take a night tour of Ashgabat. 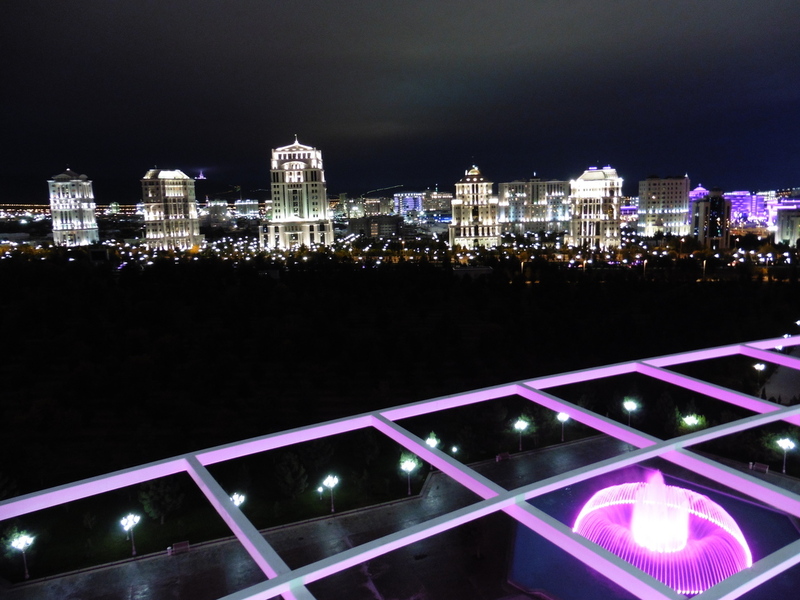 With the white marble buildings lit up by brightly coloured neon lights, Ashgabat is a truly spectacular place after dark. Spend the night at the Paytagt Guesthouse.